All new leather jacket for 2010, beautiful Cowhide smooth finish leather. 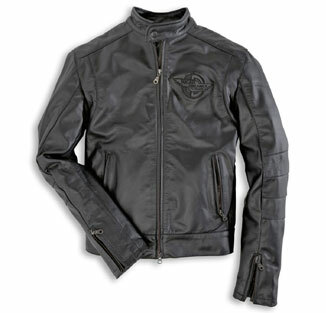 ALL Black with the Meccanica logoembossed on the back and on the left breast. This jacket is a reproduction and has removable CE approved protections, a sanitized long lasting THINSULATE 3M zipout lining, an adjustable hip fastening and stretch panels to improve movement. All labels and logo stitched and ebmroided.